With the trade talks between the United States and China settled amicably without any all-out trade war threats, the global markets roared through life. For example, the Straits Times Index (STI) closed Monday’s trading session at 3,548.23, up 18.96 points. This brings the year-to-date performance to 4.27 per cent. 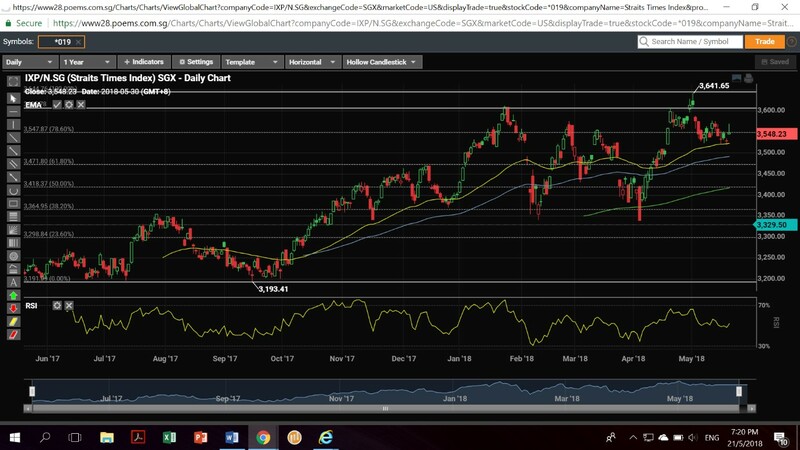 Looking at the one-year daily chart of the Straits Times Index (STI), we think that there is some optimism, but is not all-out bullish yet with the 14-day relative strength index (RSI) at a neutral level of 50-51. We don’t think today’s rally (May 21, 2018) is going to be the true indicator that the local investors will go all out to invest in stocks. It is a positive start to the week, but is not expected to be any indication that will pull the markets up ahead. We think that there is a need to gather more data before making a definite conclusion. The US Federal Reserve is releasing their May 02 meeting minutes this week. If readers were to recall, the US Fed left interest rates unchanged at a range of 1.5 per cent to 1.75 per cent expected. However, during the meeting, the central bank officials introduced the word “symmetric” to describe inflation target. Analysts perceived the word symmetric as implying a tolerance of higher inflation. If the Fed thinks that inflation can be allowed to rise up a bit more, the pace of rate rises would be slower, thus weighing on the US Dollar. Second, the Fed has left out the phrase that the outlook has improved. Some analysts think that it could be a response to a weaker first quarter gross domestic product (GDP) data. Moreover, the first estimate of 1Q GDP data was published before the meeting. Third, the latest release of the May minutes is highly followed mainly for clues to the next meeting in June where it is widely expected that the Fed will raise interest rates in the second of the three rounds of rate hikes expected in 2018. According to the Fed Funds Futures markets, the odds for another 25 basis points (bps) hike in interest rates for June is above 90 per cent. Most market watchers think that the Fed is in tune with what the market expectations, though the Fed is not bound to those expectations. The markets will closely watch for phrases like “continue with the gradual pace of rate hikes” or something close to the phrase, this could set up a confirmation of the current bias and good support for the US Dollar. However, if the Fed were to think otherwise, or there are no clear indications, then we expect all bets are off for June’s meeting. But, we don’t expect Fed Chairman Jerome Powell and the committee members to deviate from the three rate hikes that have been implicitly communicated since the start of 2018. True to the what many analysts have hoped for, the May meeting minutes noted that “a temporary period of inflation modestly above 2 per cent would be consistent with the Committee’s symmetric inflation objective.” This sentence might mean that the Fed is able to tolerate some form of inflation for a period of time before taking any actions on the interest rates. However, there seems to be an expectation that the Fed would not deviate much from ending policy accommodation as noted by the latest Fed fund futures after the May minutes were released. The probability remains at 95 percent certain for a rate hike on June 13 when the actual meeting takes place. However, if we were to look past the June Fed meeting, things are expected to be very uncertain, as there appears to be not much consensus among Fed committee members on how to decide on the rates. It is also reflected in the probability table with an average of 70 to 73 percent of interest rate hikes in September and November 2018. This trading week, we got many US retailers reporting mixed earnings. Department chain store operator Target, and home improvement retailer Lowe’s reported lower earnings and missed analysts’ expectations. This year’s retail earnings have been rocked by spring weather, weak confidence, and uncertainties over tariff talks between US and China. 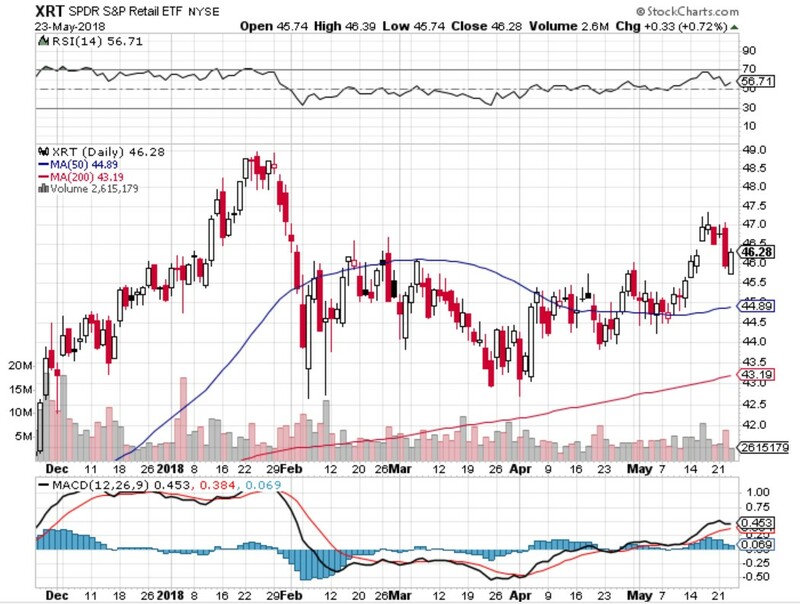 If we were to take a look at the SPDR Retail ETF, it showed some risks were taken off the table from the table due to the latest mixed earnings reports. The one-year daily chart of the SPDR S&P Retail ETF (XRT) shown above depicts the dropping off the relative strength index (RSI) from a peak of 70 to the mid-point range of 56. 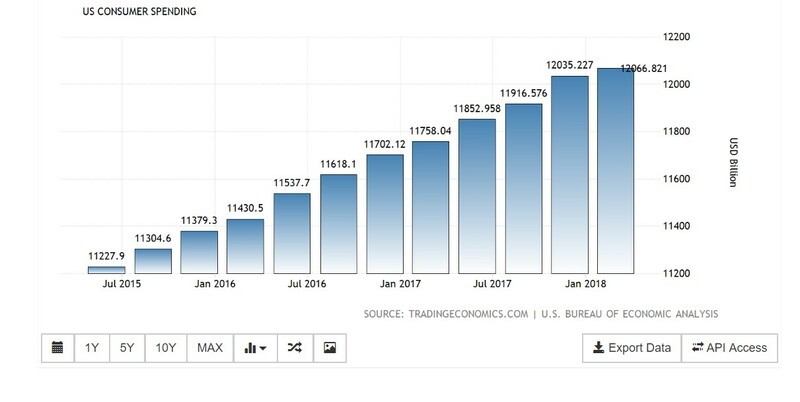 Some will question if this is a healthy correction given that the US consumption spending generates about two-thirds of the overall US gross domestic product (GDP). 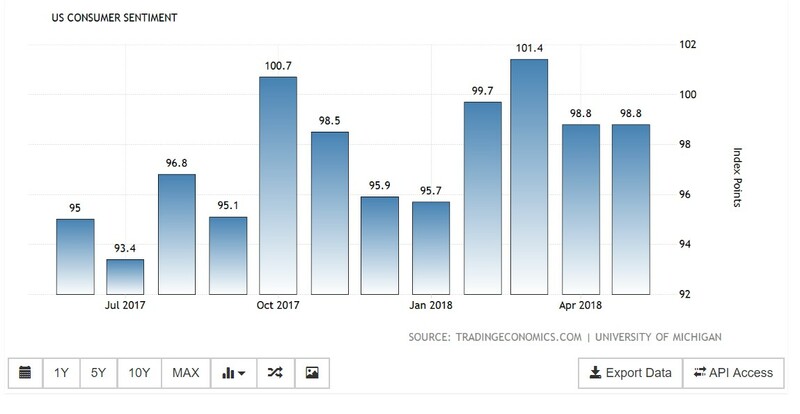 If were to examine the US consumer sentiment indices by the University of Michigan, we noted that there has been a healthy and stable level of consumer sentiment despite the drop of a peak of the reading of 101.4 in March to 98.8 in May 2018. US consumers are still spending with a total of SU$1.21 trillion in the first quarter of 2018. This is a significant improvement from the US$1.19 trillion in the final quarter of 2017. It is on a rising trend and there appears to be no signs of levelling off. However, we cannot discount the possibility of US congressional mid-term elections to cause some distraction and uncertainties to the US consumer spending behaviour. We noted that there are several congressional members, Republicans and Democrats, are up for election this coming November, and their opposing candidates might turn up the heat, and could sway voters’ sentiments through incentives, and votes gathering. We think that this might impact how consumers will spend, and type of spending priorities they are going to focus on. As the bad news of public listed water services company Hyflux Ltd over their credit restructuring plans start streaming into the market, many market participants started to take a step back wondering if other similar water treatment firms will end up in a similar fate as Hyflux. Hyflux Ltd was founded in 1989 by a Malaysian born entrepreneur Olivia Lum who took the household name to greater heights when it embarked on an aggressive expansion plan in the Middle-East, and Asia Pacific regions. The company’s original name was Hydrochem (S) Pte Ltd which was incorporated on June 20, 1989 and started operations with two other staff. During the early years, Ms Lum was said to have knocked on countless doors of factories in Singapore and Malaysia to sell water treatment products and systems using traditional technologies. Throughout the years, Hyflux has expanded, and issued debt for most of their capital expenditures. It was cheap issuing debt during in the low interest environments. However, as the company diversified into the wholesale electricity market, things started to fumble. The sale ofTuasspring plant is one of the results of intense competition rooting out weaker players. The company’s finances became too stretched with negative operating cash flows each year, and finally, on May 22, 2018, Hyflux announced that it had applied for a 30-day court protection to facilitate the restructuring of its S$1.5 billion debt. The company also announced that it plans to skip the upcoming coupon interest payment on its S$500 million perpetual securities. Hyflux’s financials have been relatively weak with negative operating cash flows since FY 2014, while debt-to-equity ratios have been high at around 155.75 per cent. The company is also suffered losses to its bottom line during financial year end 2017 at negative S$34.46 million. The weak financials might be one of the ‘red flags’ that could have prompted the investor or potential investor to hold back. 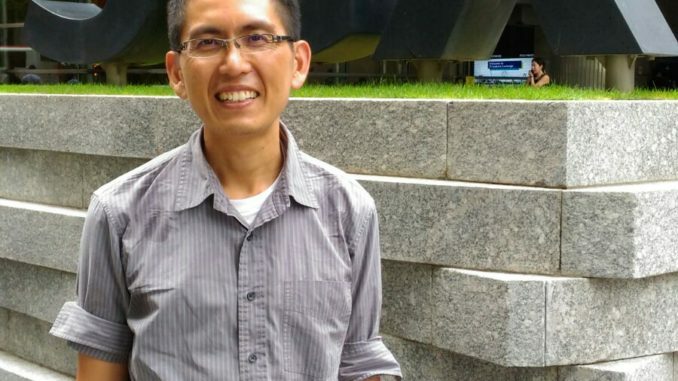 The local investor protection body, Securities Investors Association of Singapore (SIAS) has came out to urge Hyflux to organise dialogue sessions to explain the current restructuring plan, and to treat perpetual securities holders and common shareholders equally. Hyflux was said to make arrangements for dialogue sessions over the course of next few months. 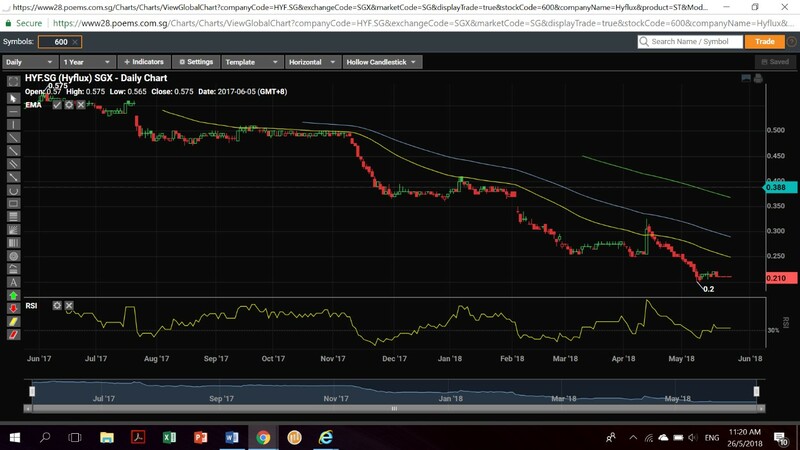 The stock price was seen falling precipitously from a high of S$0.50 a year ago to the last traded price of S$0.21 before the counter got suspended this week. The stock did not see much light at the end of the tunnel and it continue to plummet more significantly after it announced the postponement of the first call date for its perpetual securities on April 25, 2018. We hope that it will not be a tragic end to the company, and the credit restructuring period shall provide some time for the company to come up with solutions to stave off the heavy debt burden. The Singapore Straits Times Index (STI) closed Friday’s trading session at 3,513.23, down 15.69 points, or 0.44 per cent lower. The year-to-date performance is narrowed to a gain of 3.24 per cent. The total trading volume during Friday’s session was relatively unchanged as compared to Thursday with 1.50 billion shares worth S$1.03 billion changed hands. On Thursday, the total share trading volume amounted to 1.53 billion, and the dollar trading volume was worth S$1.16 billion. There were 159 gaining stocks as compared to 219 laggard counters traded on Friday. Most of the investors were reacting to overnight news that President Trump has cancelled a planned June 12 meeting with North Korean President Kim Jong Un. However, on May 25 after Asian markets were closed, the President disclosed to reporters that there is still a chance that the June 12 summit can be revived as the communication channels with North Korea re-opened. The back and forth, on top of mixed US retailers’ earnings, and the upcoming US Memorial Day weekend have caused many investors to pause, and hold back on their investments while awaiting for more data, and clarification. Moreover, the Singapore market is at the tail-end of the earnings season, and results revealed by The Business Times showed mixed results with more companies reporting missed estimates during the quarter ended March 31, 2018. The favourable economic report showed Singapore’s gross domestic product (GDP) rose 4.4 per cent during the first quarter ending March 31, 2018, with full-year growth expected to come in at “2.5 to 3.5 per cent” this year, according to the Ministry of Trade and Industry (MTI). The 4.4 percent headline GDP number was comparable from the initial estimates. The overall growth during the first quarter was driven by growth in the manufacturing sector which surged 9.8 per cent, up from its 4.8 per cent expansion in the final quarter of 2017. The GDP growth was also stretched higher by the top three sectors including finance and insurance sector. The wholesale trade sector also drove growth higher. As we head to the next six to seven months before 2018 ends, investors are hopeful that they are able to look back the past, and constantly follow good stock picks. We recognise that there are geopolitical issues to keep in mind, however, we should put to perspectives that there is always a mean reversion for markets. We need to keep in mind about the fundamentals of the companies we invested in, and recognise the volatility is inevitable. There is no point in timing the market unless you hold the stocks on a short-term basis, or just want to punt the counter. 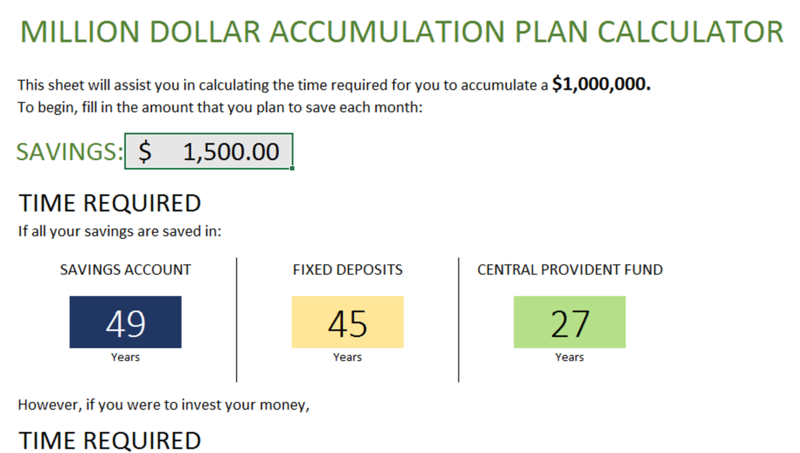 We do not advise timing strategies, but to invest in good, value-add, strong counters that deliver sustainable financial results. We also appreciate companies that prove resilient in countering disruptions through re-invention of their business processes. We think that it is through a mix of innovation, and adaptability, the companies we invested need to focused on shareholder interests, and not take too much unnecessary risks just to prop up the stock price. Such artificial propping up of weak companies would only leave tears behind. The S&P 500 index ended Friday’s trading session at a decline of 6.43 points, or negative 0.24 per cent at 2,721.33. The losses were sparked by underperformances in the energy and financial sectors as oil prices fell due to proposed resumption of oil production output increases by OPEC, and lower interest rate risks which could narrow the net interest margins of banks. 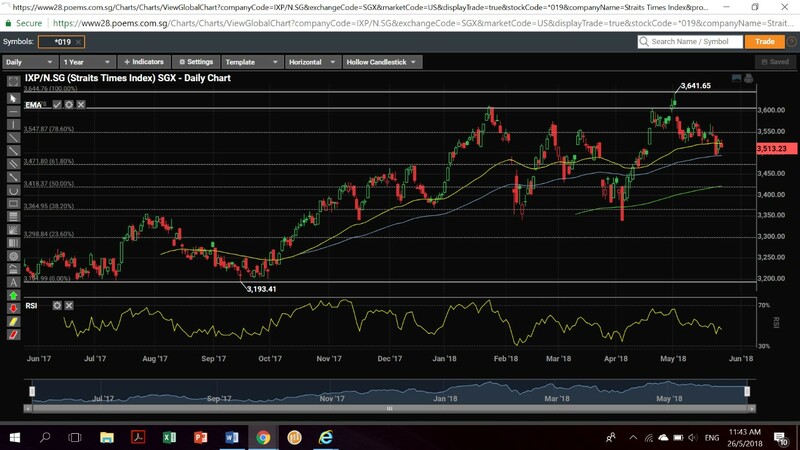 Looking at the one-year daily chart of the S&P 500 index, there appears to be a consolidation of the index at around the 2,720 levels with the 14-day relative strength index (RSI) remaining stable at around 56 to 57 levels. 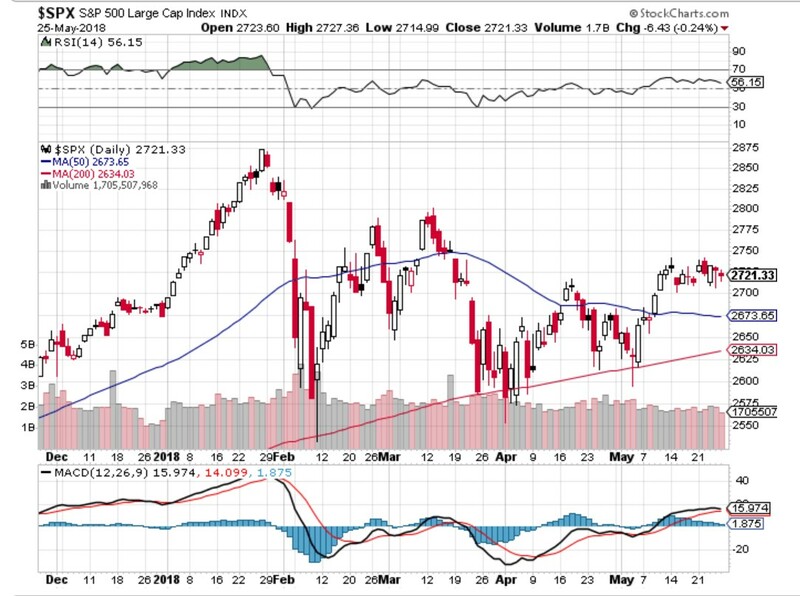 Although the index is still above the 50-day moving average (MA) line, we think that as the summer months approach, the US markets might be vulnerable to large and volatile swings due to the low trading volume. With the release of the May 02 Fed meeting minutes, along with downshift in oil prices, Memorial Day weekend is a boon to many investors seeking to cash out some returns to enjoy the long weekend vacation. However, looking forward in the coming months, there are a lot of uncertainties ranging from geopolitical tensions, the fragile state of the US-China trade negotiations, the uncertainties relating to interest rate hikes by the US Federal Reserve, sustainable consumer confidence, and earnings growth, among others. It looks set to be an interesting next half of the year in 2018 for investors. Note: Model equity portfolio performance as of May 25, 2018. For illustration purposes only, and information is not verified by third party. Past performance is not necessarily indicative of future performance. Please seek the advice of your qualified licensed financial adviser before any investments are undertaken. Since the inception of the model equity portfolio at the end of November 2016, the latest portfolio returns this week have shown a major outperformance of 85.29 per cent, inclusive of capital returns, dividends earned, and realised returns earned during the last rebalancing round on December 31, 2017. This compares to the total return of 20.93 per cent for the Straits Times Index (STI) during the same time period. The top three holdings in total return terms (dividends plus capital gains) include Nordic (up 42.1 per cent since end June 2017); followed by Ascendas Reit (up 12.8 per cent since November 2016), and SATS Ltd (up 11.0 per cent since December 2016). The model equity portfolio did experience a shortfall coming from Singtel (down 11.9 per cent since December 2016); followed by Straits Trading (down 13.5 per cent since end June 2017). There are not many companies reporting as the earnings season winds down. The sole STI component stock reporting is SATS Limited and its earnings release for the fourth quarter ending March 31, 2018 is due on May 30. Some of the key economic data due for release include industrial production figures for the month of April 2018 to gauge whether the economy is on tis sustainable footing following the outburst of factory orders for the month of April. Some of the key US economic data to be released next week include the private sector ADP Employment Change in April, followed by the second estimate of US GDP growth for the first quarter of 2018. Overall, the market activities are expected to stay muted, but investors should not necessarily be tuned out of the markets as there can still be good investment gems to check out. Best of luck all.